Attitudes toward socialism may have shifted since Vermont Sen. Bernie Sanders ran for president in 2016. 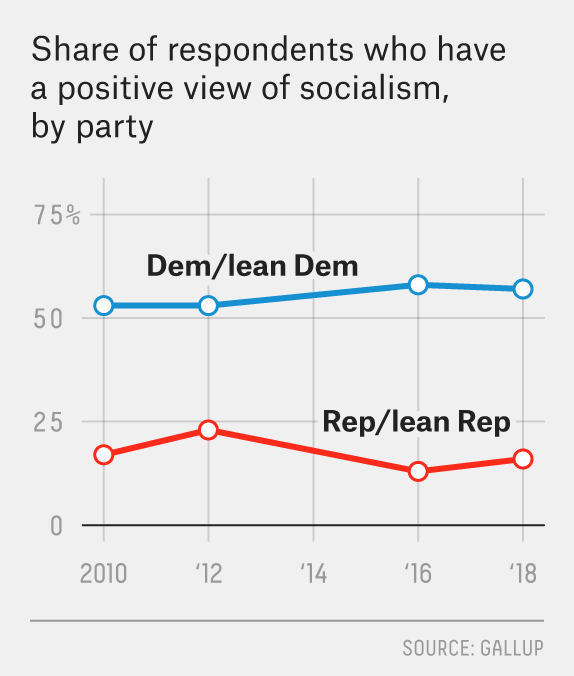 Although Democrats are more likely to favor socialism, Republicans are more likely to believe that the country is moving in a socialist direction. For example, a January 2016 survey by Investor’s Business Daily/TIPP found that 54 percent of Republicans agreed that the U.S. is “evolving into a socialist state,” compared with 16 percent of Democrats. And in a January poll from Fox News, 80 percent of Republicans and 34 percent of Democrats said it would be “a bad thing” for the United States “to move away from capitalism and more toward socialism.” If Trump continues to call policies and political opponents socialist, the polls show that most Republicans may interpret that as the disparagement he intends it to be. In June 2015, Gallup asked Americans about whether they’d vote for a socialist if their party nominated one — and found that 50 percent of respondents said they would not be willing to. The poll tested 11 different candidate characteristics — for example, whether someone was an evangelical Christian or a woman — to see what voters disliked most, and it found that the biggest disqualifier for both parties was a candidate who identified as a socialist. Thirty-eight percent of Democrats said they weren’t willing to vote for a socialist, and 73 percent of Republicans said the same. Now, this polling took place shortly after Sanders’s 2016 campaign got started, so it’s possible that attitudes have shifted since then — after all, three socialist candidates ran for Congress in the 2018 midterm elections and won. Nonetheless, an August 2018 survey from YouGov found that 41 percent of Democrats and 29 percent of independents said they would feel “enthusiastic” about or “comfortable” with “a candidate for president who described themselves as a socialist,” while 59 percent of Democrats and 71 percent of independents said they would have “some reservations” or would feel “very uncomfortable.” These numbers suggest that there is still an opportunity for Trump to score points by painting his opponent as a socialist in 2020, which in addition to revving up Republicans may also undermine the cohesion that Democrats and independents have built on anti-Trump sentiment. Now almost 30 years after the end of the Cold War, Americans don’t view socialism the same way they once did. In 1949, the fear of communism had gripped the U.S., and Gallup asked Americans what they thought “socialism” meant. The pollster found that 34 percent of Americans thought socialism signified “government ownership or control” — of businesses, utilities and “everything.” At that time, 12 percent of respondents associated socialism with “equality” — equal standing for everyone.4 But when Gallup asked the same question in September 2018, it found that the percentage of respondents who associated socialism with equality had climbed to 23 percent, while only 17 percent said they viewed socialism as signifying government ownership or control.5 And in 2018, 10 percent of Americans associated socialism with benefits like free social services and universal access to medicine, which was much higher than the 2 percent who said the same in 1949. That said, Republicans in 2018 were more likely to view socialism as government ownership or control than Democrats were,6 23 percent to 13 percent; Democrats were slightly more likely than Republicans to view socialism as signifying equality, 26 percent to 23 percent. The parties’ different opinions of socialism may stem from different ideas of what a socialist country looks like. For example, Trump and Republicans have used Venezuela as an example of a failed socialist government that has fallen into economic collapse and chaos. Democrats and Sanders, meanwhile, often cite Nordic countries with strong social safety nets as examples of socialism. All in all, Trump may want to use socialism as a cudgel against Democrats in 2020. It could help him shore up the GOP base and perhaps turn some anti-socialist Democrats and independents against his opponents. But it’s 2019, not 1949; socialism doesn’t automatically evoke the Iron Curtain anymore, and fewer Americans now associate socialism with government control or ownership. Trump’s anti-socialist message may find less success than he hopes. Political scientists might refer to these plans as social democracy, which involves higher levels of government involvement in an otherwise capitalist economy, rather than strict socialism, in which most aspects of the economy are directly owned and run by the government. Both numbers include independents who lean toward that party. The poll did not define “socialism” for respondents, so answers reflect respondents’ attitudes toward what they understood socialism to be. In the 1949 poll, 36 percent expressed no opinion. In the 2018 poll, 23 percent expressed no opinion. Each party’s numbers include independents who lean toward that party.